Mailhot, Pierre and Jean-marie Dubois. 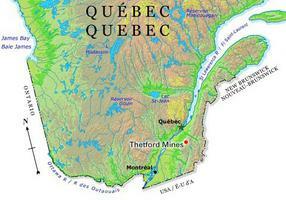 "Thetford Mines". The Canadian Encyclopedia, 29 May 2018, Historica Canada. https://www.thecanadianencyclopedia.ca/en/article/thetford-mines. Accessed 20 April 2019. In 1876 Joseph Fecteau scraped some fibres from a greenish rock with his fingernail; without realizing it, he had discovered ASBESTOS. In 1877 Roger Ward claimed the first mining rights and the Johnson brothers began production the following year. Thetford Mines, Qué, City, pop 16 628 (2001c), 17 635 (1996c), 18 251 (1991c), area 36.95 km2, inc 1892, is located on Rivière Bécancour in the Appalachians, 107 km south of Québec City. It was named after the town of Thetford in Norfolk, Eng. In 1876 Joseph Fecteau scraped some fibres from a greenish rock with his fingernail; without realizing it, he had discovered asbestos. In 1877 Roger Ward claimed the first mining rights and the Johnson brothers began production the following year. In 1879 the arrival of the railway made it possible to transport the mineral in larger quantities and more quickly to Lévis, Qué. The city grew rapidly as the mines attracted people from other areas. First named Kingsville after William King, an important mine owner, the present name was given in 1905. Today, both underground and open-face mines are in operation, and the streets of the city are built between the mines and the asbestos tailings. In the 1950s a major part of downtown was relocated to enlarge the King mine. Called the "Capitale mondiale de l'amiante" (Asbestos Capital of the World) and the "Cité de l'or blanc" (City of White Gold), Thetford Mines is the largest production centre for this fibre in the Western world. Since the 1980s, awareness of the health hazards associated with asbestos has caused demand to fall, resulting in a decrease of production and thus a reduction of the number of people employed in the industry. The city has also developed other sectors such as trailer, snowmobile, mining-equipment and plastics factories. Thetford Mines is also the administrative centre of the regional county municipality of Amiante. The city has a famous mineralogy and mining museum (1976).